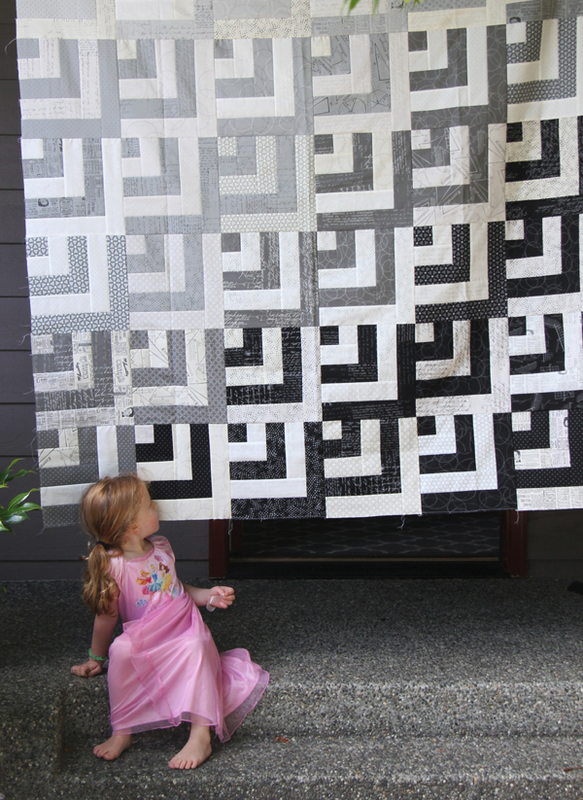 I woke up to lots of emails asking for a pattern for the Grayscale quilt, and since I’m not planning on writing a pattern for this one I threw together a quickie tutorial. Literally…I threw it together…user beware. This top measures 60″ x 70″, with a 10″ finished block size, so it’s easy to make larger or smaller. I used these two jelly rolls as mentioned in my previous post, but you could use one print jelly roll and solid jelly roll to cut down cost. If you want to lay out the blocks with with a gradient effect like I did, just make sure your darker jelly roll has some light and dark prints in it. 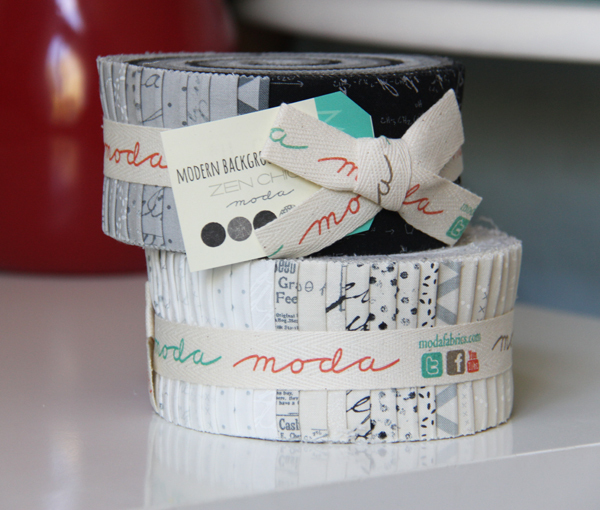 If you’re new to jelly rolls, it contains 42 (but can be more or less) strips 2 1/2″ x the width of the fabric. You’ll make 21 of Block A (white at the corner square and outer strips), and 21 of Block B (dark at the corner square and outer strips), 42 blocks total. To make the Block A blocks, choose 21 white/light strips, and 21 dark strips. Cut the white 2 1/2″ strips into: 1 square 2 1/2″, 1 strip 4 1/2″, 1 strip 6 1/2″, 1 strip 8 1/2″, and 1 strip 10 1/2″. Cut the dark strip into: 1 square 2 1/2″, 1 strip 4 1/2″, 1 strip 6 1/2″, and 1 strip 8 1/2″. You can cut all your light and dark strips together and whip out the cutting in no time! 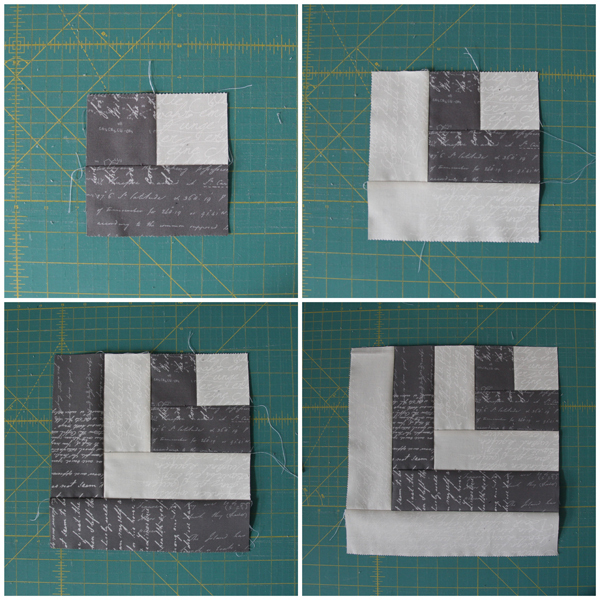 Start with a white 2 1/2″ square and sew a dark 2 1/2″ square to one side, press. Sew the dark 4 1/2″ strip to one side, press. Repeat with the light and dark 4 1/2″, 6 1/2″, 8 1/2″ strips, and finally add the white 10 1/2″ strips, making sure you are sewing them to the right side as you go! The block will measure 10 1/2″ square. 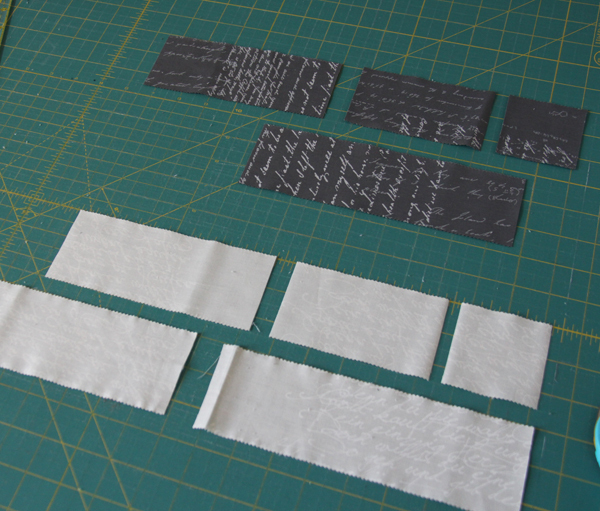 To make the Block B blocks….cut and sew the blocks the exact same way, except switch the white and dark fabrics that I have above. You’ll choose 21 light prints, and 21 dark prints again, but this time cut the dark strips with a 10 1/2″ strip instead of the white, and start with a dark square in the corner when sewing. Lay them out alternating Block A and Block B, and if you use dark strips with lighter/darker prints in it, you can lay them out with a gradient effect like I did. Make sense? I hope so…it’s pretty easy and a fun/fast quilt to make, especially when you cut all of your Block A or B blocks at once and chain piece like crazy! Sophie’s not a fan of this one…not enough pink. Or princesses. If I re-made this quilt I would probably add more dark/black blocks, or a color like navy blue so there weren’t so many gray/beige blocks. If you use two jelly rolls and the same cutting methods you’ll have lots of scraps left over to make pillows, a table runner, or maybe even a baby quilt! I really love the pattern. I would add one red block or stripe to add a color spot. Love this quilt! 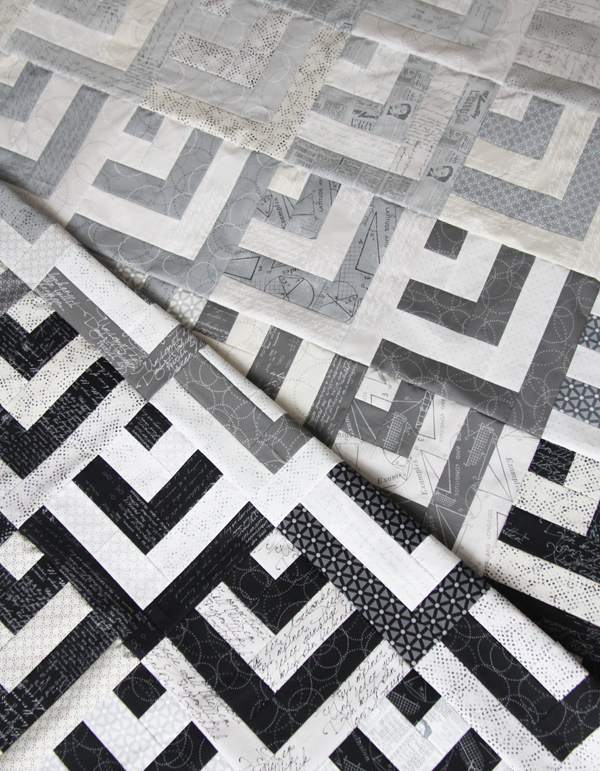 The gradual change across the quilt is very modern! And the design would be perfect for a male too! Thanks for sharing it! Such a great design and it would be perfect for a guy too! This quilt is fabulous! Thanks so very much for sharing your tutorial with us! Thank you for sharing this quilt tutorial (you did a great job) :). Love the way the quilt colors go from light to dark. Thanks for the tutorial. It’s a great pattern. Thank you so much for the tutorial!! So sweet of you. Wow – and more WOW! It’s such a cool quilt! Maybe throw some pink on the back….just for Sophie! Thank you for the tutorial – you’re awesome! Thanks for the instruction. Impatiently waiting for my jelly rolls to arrive. My new favorite quilt! Love this! Thanks so much for the tutorial, I’m determined to make this…this weekend! This looks very effective! I will definitely try it out. My grand daughter loves this pattern and wants me to make a queen size quilt. I’m thinking if each jelly roll is 3 yards of fabric and you use 2 it makes 42 blocks. So I’m going to need roughly 12-14 yards? Yikes lol she wants it in black white and blue. Any thoughts on this? My pieces didn’t line up. It’s almost like another 1/4″ is needed on some unless I did something wrong. Sewed the two 2 1/2″ together and the 4 1/2″ one was fine. That left a block 4 1/2″ by 4 3/4″. If I put the 4 1/2″ under the other 4 1/2″ the 6 1/2″ didn’t line up properly. Not sure what I’m doing wrong. Hi, thx so much for the calculations. I first saw this pattern in a quilt hanging in the Springfield IL airport in September. 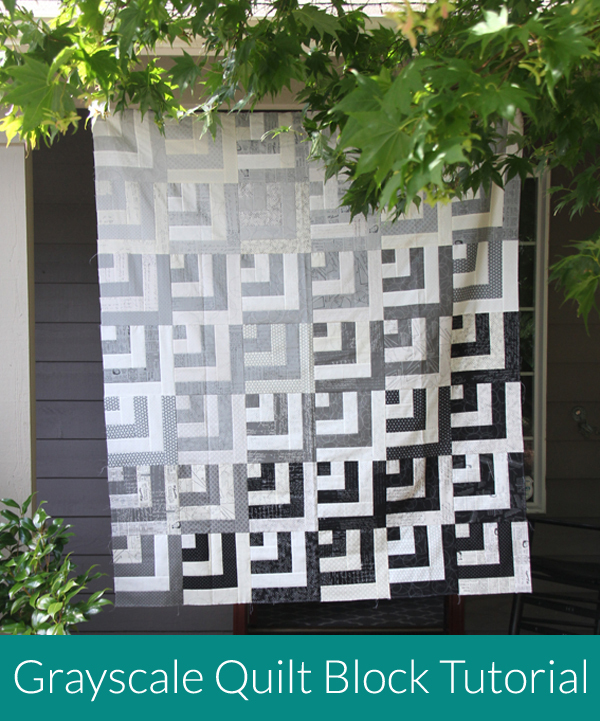 The entire quilt is black and white with the exception of one block in grey and white and one in light green and white. And, the blocks were set on point. Liked it so much I took a picture so I could do the calculations myself, but now I don’t have to. Hope to try it after the holidays and my quilt have have at least one red and white block. Thx again, and if I can figure out how to get the pic from my phone to the tablet I’ll send it to you. And I love ur website. What a beautiful idea! Thank you very much! What kind of topstitching did you do. If any, I can’t tell by the photo. Stich in the ditch or something else? Lovely – especially, the redhead 💕But why isn’t there an emoji with red hair? ☺Beautiful quilt. I have been trying to find the fabrics. Where can they be purchased? Thank you for your assistance. May I use your tutorial for my stash bee block? We used it for a lottery block for our Las Vegas Modern Quilt Guild and I love how it turns out. Many thanks Allison. I will, of course, give a link to your tutorial and giving you all the credit for a great design and tutorial.